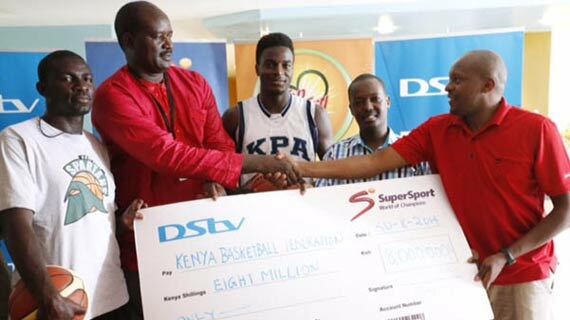 The Kenya basketball fraternity will have all the reasons to smile as the Kenya Basketball League last weekend landed 12 Million shillings in sponsorship courtesy of Africa’s Pay TV service Providers DSTV/SuperSport and Menengai Oil. This is the first biggest sponsorship for Kenya’s basketball and could signify the beginning of the long awaited positive growth and development of the game that could be labeled as one of the sleeping giants in Africa. Of the 12 Million, DSTV/SuperSport will commit 8 Million shillings towards the game with initiatives that will also include live broadcasts of at least 50 games on SuperSport, weekly magazine shows that focus on players, matches and other exciting attractions. While presenting the 2014 sponsorship, MultiChoice Kenya Finance Manager, Janet Oyugi reiterated the company’s long-term commitment to the Kenyan market through its investment in local content, sport and talent. “For the over 18 years that MultiChoice has been in this market, no other company has invested as much in the Kenyan pay television market than DStv. Through our channels such as SuperSport, we shall continue making extensive investments in the production of local sport,” she said. Menengai Oil will pump in an additional 4 Million shillings to make the total sponsorship package for this season 12 Million.